Home / Posts tagged "obesity"
“I identified in 1990 the first gene in alcohol addiction. Specifically, we found the A1 allele (the minor form) of the D2 dopamine receptor (DRD2) gene to be associated with addiction. We researched the brain characteristics of the subjects who had the DRD2 A1 allele. To do that, we carried out a pharmacological study on the brains of deceased individuals who had or did not have the A1 allele. What we found was that subjects with the A1 allele, regardless of whether they were that of alcoholics or controls, had fewer D2 dopamine receptors than those who lacked this allele. To compensate for this deficiency state, individuals used their addictive substance to release brain dopamine and activate their few dopamine receptors, which would activate their brain dopamine reward or pleasure system. Some foods significantly increases brain dopamine levels.” — Ernest Noble, MD, PhD. Consumption of high volumes of natural rewards like foods that are high fat/sugar dense increase Delta FOSB proteins that effects the brain reward system and enhances motivation for more (binge-eating, craving). ΔFosB is a highly stable protein which produce lasting changes in gene expression. Dr. Eric Nestler of the Mt. Sinai School of Medicine on NIMH radio. Low functioning of the dopamine reward circulatory may cause individuals to overeat to compensate for this low reward deficit, which through conditioning produces greater anticipatory food reward and heightened development of the somatosensory cortex. STICE, SPOOR, BOHON, VELDHUIZEN, AND SMALL. Relation of Reward From Food Intake and Anticipated Food Intake to Obesity: A Functional Magnetic Resonance Imaging Study. Journal of Abnormal Psychology 2008, Vol. 117, No. 4, 924-935. Ingestion of different nutrients, such as fats vs. sugars, normally prodces different effects on physiology, the brain, and behavior. However, they do share certain neural pathways for reinforcement of behavior including the dopamine system. When these nutrients are consumed in the form of binges, this can release excessive dopamine that causes compensatory changes that are comparable to the effects of drugs of abuse. Nicole M. Avena, Pedro Rada, Bartley G. Hoebel, 2008. Sugar vs. Fat Bingeing: Notable Differences in Addictive-like Behaviors; Department of Psychology, Princeton University. PET scans reveal that obese subjects show a reduction in dopamine receptor availability that is associated with the body weight of the subject. Wang, G.J., Volkow, N.D., Thanos, P.K., Fowler, J.S., 2004b. Similarity between obesity and drug addiction as assessed by neurofunctional imaging. Journal of Addictive Diseases 23, 39-53. The decrease in dopamine receptors in obese subjects is similar in magnitude to the reductions reported in drug-dependent subjects. Wang, G.J., Volkow, N.D., Logan, J., Pappas, N.R., Wong, C.T., Zhu, W., Netusil, N., Fowler, J.S., 2001. Brain dopamine and obesity. Lancet, no.9253, 354-357. The involvement of the dopamine system in reward and reinforcement has led to the hypothesis that alterations on dopamine activity in obese subjects disposes them excessive use of food. Exposure to especially palatable foods, such as cake and ice cream, activates several brain regions including the anterior insula and right orbitofrontal cortex (Wang et al., 2004a), which may underlie the motivation to procure food. Rolls, E.T., 2006. Brain mechanisms underlying flavour and appetite. Philosophical Transactions of the Royal Society of London Series B — Biological Sciences 361, 1123-1136. Volkow published a study in which her team found that obese people who have fewer dopamine receptors also have less activity in their prefrontal cortex. N. D. Volkow, “Inverse Association Between BMI and Prefrontal Metabolic Activity in Healthy Adults,” Obesity 17, no. 1 (2008), 60–65. doi:10.1038/oby.2008.469. Drugs of abuse can alter dopamine and opioid receptors in the mesolimbic regions of the brain. N.M. Avena, Rada, Hoebel (2008) Evidence for sugar addiction: Behavioral and neurochemical effects of intermittent, excessive sugar intake. Neuroscience and Biobehavioral Reviews, 28. Children who ate more junk food (processed, refined, sweets, soda, and snacks) in the first years of life demonstrated more internalizing behaviors, such as worry, sadness, crying, and anxiety. They also exhibited more externalizing behaviors, such as aggression, tantrums, and hyperactivity. Moms who ate more of these foods while pregnant had children with higher levels of externalizing behaviors, independent of the children’s diets. Jacka FN, Ystrom E, Brantsaeter AL, et al. Maternal and early postnatal nutrition and mental health of offspring by age 5 years: a prospective cohort study. J Am Acad Child Adolesc Psychiatry. 2013;52:1038-1047. Dietary patterns characterized by higher intakes of processed or fried foods, refined grains, and sugary were associated with increased depression and anxiety in both Australian and Norwegian adults. Jacka FN, Pasco JA, Mykletun A, et al. Association of Western and traditional diets with depression and anxiety in women. Am J Psychiatry. 2010;167:305-311. Jacka FN, Mykletun A, Berk M, Bjelland I, Tell G. The association between habitual diet quality and the common mental disorders in community-dwelling adults: the Hordaland Health Study. Psychosom Med. 2011;73:483-490. Unhealthy diets were associated with poorer mental health in more than 3000 adolescents aged 11-18 years. Investigators found that those whose diets were higher in snack and processed foods scored significantly worse on the Pediatric Quality of Life Inventory. Jacka FN, Ystrom E, Brantsaeter AL, et al. Maternal and early postnatal nutrition and mental health of offspring by age 5 years: a prospective cohort study. J Am Acad Child Adolesc Psychiatry. 2013;52:1038-1047. The subset of BED patients classified as having YFAS “food addiction” appear to represent a more disturbed variant characterized by greater eating disorder psychopathology and associated pathology. Classification of “food addiction” was met by 57% of BED patients who had significantly higher levels of depression, negative affect, emotion dysregulation, eating disorder psychopathology, and lower self-esteem. Gearhardt AN, White MA, Masheb RM, Morgan PT, Crosby RD, Grilo CM. An examination of the food addiction construct in obese patients with binge eating disorder. Int J Eat Disord. 2012 Jul;45(5):657-63. doi: 10.1002/eat.20957. Epub 2011 Aug 30. There is increasing evidence that disruption of energy homeostasis can affect the reward circuitry and that overconsumption of rewarding food can lead to changes in the reward circuitry that result in compulsive food intake akin to the phenotype seen with addiction. Volkow ND, Wang GJ, Tomasi D, Baler RD. The Addictive Dimensionality of Obesity. Biol Psychiatry. 2013 Jan 29. pii: S0006-3223(13)00011-5. doi: 10.1016/j.biopsych.2012.12.020. Yale University researchers used functional MRI (fMRI) studies to prove that both lean and obese women who test positive for addictive behavior around food show the exact same pattern of neural activity as a chronic drug abuser: very high levels of anticipation of their drug of choice—in this case, a chocolate milk shake—but very low levels of satisfaction after consuming them. A. Gearhardt et al., “Neural Correlates of Food Addiction,” Archives of General Psychiatry 68, no. 8 (August 2011):808–16. Published electronically April 4, 2011. Kenney demonstrated that overconsumption of palatable food triggers addiction-like neuroadaptive responses in brain reward circuits and drives the development of compulsive eating. Common hedonic mechanisms may therefore underlie obesity and drug addiction. P. Johnson and P. J. Kenny, “Dopamine D2 Receptors in Addiction-Like Reward Dysfunction and Compulsive Eating in Obese Rats,” Nature Neuroscience 13, no. 5 (2010):635–41. People were 30 to 40 percent more likely to be obese if they had addiction in the family. For women, the chance was 50 percent greater. R. Grucza et al., “The Emerging Link Between Alcoholism Link and Obesity in the US,” Archives of General Psychiatry 67, no. 12 (2010):1301–8. The overall enhancement of consummatory behaviors (both ethanol and water) suggests that RYGB may facilitate alcohol consumption, which in vulnerable individuals could lead to abuse and addiction. Thanos PK, Subrize M, Delis F, Cooney RN, Culnan D, Sun M, Wang GJ, Volkow ND, Hajnal A. Gastric bypass increases ethanol and water consumption in diet-induced obese rats. Obes Surg. 2012 Dec;22(12):1884-92. doi: 10.1007/s11695-012-0749-2. Numorous studies have found that sensitization to one drug can lead subsequent increased intake of another drug or substance. Ellgren et al., 2007; Henningfield et al., 1990; Hubbell et al., 1993; Liguori et al., 1997; Nicols et al., 1991; Piazza et al., 1989; Vezina et al., 2002; Volpicelli et al., 1991. Somatic signs of withdrawal, such as teeth chattering, forepaw tremor, and head shakes are observed in rats that have had sugar eliminated from their diet. Colantuoni, C., Rada, P., McCarthy, J., Patten, C., Avena, N.M., Chadeayne, A., Hoebel, B.G., 2002. Evidence that intermittent, excessive sugar intake causes endogenous opioid dependence. Obesity Research 10, 478-488. These animals are also anxious, as measured by reduced time spent on the exposed arm of an elevated plus-maze. Colantuoni, C., Rada, P., McCarthy, J., Patten, C., Avena, N.M., Chadeayne, A., Hoebel, B.G., 2002. Evidence that intermittent, excessive sugar intake causes endogenous opioid dependence. Obesity Research 10, 478-488. Behavioral depression has also been found following naloxone administration in intermittent sugar-fed rats. N.M. Avena, Rada, Hoebel, (2008) Evidence for sugar addiction: Behavioral and neurochemical effects of intermittent, excessive sugar intake. Neuroscience and Biobehavioral Reviews, 26. Screening for food addiction has the potential to identify people with eating difficulties that seriously compromise weight management efforts. Corsica JA, Pelchat ML. Food addiction: true or false? Curr Opin Gastroenterol. 2010 Mar;26(2):165-9. doi: 10.1097/MOG.0b013e328336528d. Signs of aggressive behavior have been found in response to removing a diet that involves intermittent sugar access. Galic, M.A., Persinger, M.A., 2002. Voluminous sucrose consumption in female rats: increased “nipiness” during periods of sucrose removal and possible oestrus periodicity. Psychological Reports 90, 58-60. If a drug becomes available again, animals will take more than they did prior to abstinence (i.e., the “deprivation effect”) Sinclair, J.D., Senter, R.J., 1968. Development of an alcohol-deprivation effects in rats. Quarterly Journal of Studies on Alcohol 29, 863-867. Exposure to especially palatable foods, such as cake and ice cream, activates several brain regions including the anterior insula and right orbitofrontal cortex which may underlie the motivation to procure food. Avena, N.M., Rada, P., Hoebel, B.G., 2008. Evidence for sugar addiction; Behabiorial and neurochemical effects of intermittent, excessive sugar intake. Neuroscience Biobehavioral Review 32(1), 20-39. Craving-related changes in fMRI signal have been identified in response to palatable foods, similar to drug craving. Pelchat, M.L., Johnson, A., Chan, R., Valdez, J., Ragland, J.D., 2004. Images of desire: food craving activation during fMRI. Neuroimage 23, 1486-1493. Similar patterns of neural activation are implicated in addictive-like eating behavior and substance dependence: elevated activation in reward circuitry in response to food cues and reduced activation of inhibitory regions in response to food intake. Gearhardt, A.N., Yokum, S., Orr, P.T., Stice, E., Corbin, W.R., & Brownell, K.D. (2011). The neural correlates of food addiction. Archives of General Psychiatry, 68, 808-816. doi:10.1001/archgenpsychiatry.2011.32. Although there exist important differences between foods and addictive drugs, ignoring analogous neural and behavioral effects of foods and drugs of abuse may result in increased food-related disease and associated social and economic burdens. Public health interventions that have been effective in reducing the impact of addictive drugs may have a role in targeting obesity and related diseases. Gearhardt AN, Grilo CM, DiLeone RJ, Brownell KD, Potenza MN (2011). Can food be addictive? Public health and policy implications. Addiction. 2011 Jul;106(7):1208-12. doi: 10.1111/j.1360-0443.2010.03301.x. Epub 2011 Feb 14. During puberty, a healthy girl will gain anywhere from 20-50 lbs. 45% of elementary age children report wanting to be thinner. Over 66% of the population of America is overweight. Nearly one-quarter are obese. 8-11 million people in the U.S. have eating disorders. 60% of women who abuse substances also have an eating disorder. 25% of Eating Disorder sufferers are men. Thirty percent of post-bariatric patients develop substance addiction. Research has uncovered neurobiological and behavioral similarities between substance dependence and excess consumption of highly processed foods. These findings have led to the theory that food addiction may play a role in obesity and disordered eating. Gearhardt AN, Corbin WR. The role of food addiction in clinical research. Curr Pharm Des. 2011;17(12):1140-2. There are several biological similarities between dependence of palatable food and drug dependence including cravings and loss of control. Fortuna JL. The obesity epidemic and food addiction: clinical similarities to drug dependence. J Psychoact Drugs. 2012;44 (1):56–63. In the model of sucrose binging, behavioral components of addiction are demonstrated and related to neurochemical changes that also occur with addictive drugs. Evidence supports the hypothesis that rats can become dependent and “addicted” to sucrose. Avena NM. The study of food addiction using animal models of binge eating. Appetite. 2010 Dec;55(3):734-7. doi: 10.1016/j.appet.2010.09.010. Epub 2010 Sep 16. This review demonstrates that rats with intermittent access to a sugar solution can show both a constellation of behaviors and parallel brain changes that are characteristic of rats that voluntarily self-administer addictive drugs. This is evidence that under some circumstances sugar can be addictive. N.M. Avena, Rada, Hoebel (2008) Evidence for sugar addiction: Behavioral and neurochemical effects of intermittent, excessive sugar intake. Neuroscience and Biobehavioral Reviews p32. Several studies have correlated the rise in the incidence of obesity with an increase in sugar consumption. Bray et al., 1992; Elliott et al., 2002; Howard and Wylie-Rosett, 2002; Ludwig et al., (2001). N.M. Avena, Rada, Hoebel (2008) Evidence for sugar addiction: Behavioral and neurochemical effects of intermittent, excessive sugar intake. Neuroscience and Biobehavioral Reviews, 31. Evidence for experimental research on animals has unearthed deep commonalities between overconsumption of sugars and drug addiction. Volkow ND, Wise RA (2005) How can drug addiction help us understand obesity? National Neuroscience 8, 555-60.; Kelley AE (2004) Memory and addiction; shared neural circuitry and molecular mechanisms. Neuron 44: 161-79; Levine AS, Kotz CM, Gosnell BA (2003) Sugars: hedonic aspects, neuroregulation, and energy balance. American Journal of Clinical Nutrition 78, 834S-842S. Both sweet tastes and drugs of abuse stimulate dopamine signaling in the ventral striatum, a brain signaling pathway critically involved in reward processing and learning. Koob, G.F., Le Moal, M., (2006) The neurobiology of addiction. San Diego: Academic Press. 490 p; Wise RA (2004) Dopamine, learning and motivation. National Review of Neuroscience 5, 483-94. Our findings clearly demonstrate that intense sweetness can surpass cocaine reward, even in drug-sensitized and addicted individuals. Citation; Lenoir M, Serre F. Cantin L, Ahmed SH (2007) Intense Sweetness Surpasses Cocaine Reward. PLoS ONE 2(8): e698. doi:10.1371/journal.pone.000069. Sugar intake may lead to an increased number of and/or affinity for opioid receptors, which in turn leads to further ingestion of sugar and may contribute to obesity. Fullerton, D.T., Getto, C.J., Swift, W.J., Carlson, I.H., 1985. Sugar, opioids, and binge eating. Brain Research Bulletin 14, 673-680. Sugar “withdrawal” upsets dopamine/acetylcholine balance in the accumbens. N.M. Avena, Rada, Hoebel (2008) Evidence for sugar addiction: Behavioral and neurochemical effects of intermittent, excessive sugar intake. Neuroscience and Biobehavioral Reviews, 28. Recent findings using positron emission tomography (PET) and functional magnetic resonance imaging (fMRI) in humans have supported the idea that aberrant eating behaviors, including those observed in obesity, may have similarities to drug dependence. Craving-related changes in fMRI signal have been identified in response to palatable foods, similar to drug craving. Pelchat, M.L., Johnson, A., Chan, R., Valdez, J., Ragland, J.D., 2004. Images of desire: food craving activation during fMRI. Neuroimage 23, 1486-1493. Sugar access repeatedly releases dopamine in response to the taste of sugar, may be important for understanding the bingeing behaviors associated with bulimia. Dopamine has been implicated in bulimia by comparing it to hypothalamic self-stimulation, which also releases dopamine without calories. (Hoebel et al., 1992). Certain functional markers of genes regulating dopamine signaling in the brain striatal area were associated with binge eating disorder (BED) and eating-related sub-phenotypes of BED. Results support the view that BED may have its causal origins in a hyper- responsiveness to rewarding stimuli such as highly palatable food. Davis C, Levitan RD, Yilmaz Z, et al. Binge eating disorder and the dopamine D2 receptor: Genotypes and sub-phenotypes. Prog Neuropsychopharmacol Bio Psychiatry. 2012;38:328–35. Some refined ingredients, such as sugars, are progressively more viewed, by laypeople and scientists alike, as addictive substances and their chronic overconsumption as food addiction. Once a controversial concept, food addiction is now considered as serious as other forms of addiction, including cocaine or heroin addiction. In addition, there is growing evidence linking increased sugar availability and consumption, particularly in infants, to the current worldwide obesity epidemic. Despite the focus on sugar addiction, some of the main conclusions drawn can be generalized to other types of food addiction. Serge H. Ahmed Ph.D., Dr. Nicole M. Avena, Dr. Kent C. Berridge, Dr. Ashley N. Gearhardt, Dr. Karine Guillem. (2013). Food Addiction. Neuroscience in the 21st Century, pp 2833-2857. The overall similarities in behavior and brain adaptation with sugar bingeing and drug intake support the theory that some eating disorders, such as bulimia, may have properties of an “addiction” in certain individuals. Davis and Claridge, (1998); Gillman and Lichtigfeld, (1986); Heubner, (1993); Marrazzi and Luby, (1986, 1990); Mercer and Holder, (1997); Riva et al., (2006). N.M. Avena, Rada, Hoebel (2008) Evidence for sugar addiction: Behavioral and neurochemical effects of intermittent, excessive sugar intake. Neuroscience and Biobehavioral Reviews, 31. Children in the low-sugar cereal condition consumed, on average, slightly more than 1 serving of cereal whereas children in the high-sugar condition consumed significantly more and almost twice the amount of refined sugar in total. Harris, J.L., Schwartz, M.B., Ustjanauskas, A., Ohri-Vachaspati, P., & Brownell, K.D. (2010). Effects of serving high-sugar cereals on children’s breakfast-eating behavior. Pediatrics, 127, 71- 6. Epub 2010 Dec 13. Dr. Yvonne Sanders-Butler started the first “Sugar Free Zone” elementary school in the United States. She eliminated all the high fat/high sugar foods from the cafeteria menus, refused to allow soft drinks in the school’s vending machines and instead allowed only water and healthy fruit juices to be sold. She also added a fitness program that incorporates nutrition and exercise into class lesson plans. The result: a 28% drop in disciplinary referrals, a 23% drop in counseling referrals and higher test scores. The kids say they have more energy and feel much better. There are also less illness related absences. SEE the Keys Semi-Starvation Experiment, 1950 showing the long-term effects of restricting food and the creation of eating disorder behaviors. You can also read the blog about this study at http://www.rebeccacooper.com/the-keys-semi-starvation-study/. Cyclic binging and food deprivation may produce alterations in opioid receptors, which help perpetuate bingeing behavior. In support, appetite dysfunctions in the form of binge eating and self-starvation can stimulate endogenous opioid activity. Aravich, P.F., Rieg, T.S., Lauterio, T.J., Doerries, L.E., 1993. Betaendorphin and dynorphin abnormalities in rats subjected to exercise and restricted feeding; relationship to anorexia nervosa? Brain Research 622, 1-8. Bulimics often restrict intake early in the day and then binge later in the evening, usually on sweet food. Gendall, K.A., Sullivan, P.E., Joyce, P.R., Carter, F.A., Bulik, C.M., 1997. The nutrient intake of women with bulimia nervosa. International Journal of Eating Disorders 21, 115-127. Bulimic patients have increased opioid receptor binding in the insula compared with controls, which correlates with recent bingeing behavior. Bencherif, B., Guarda, A.S., Colantuoni. C., Ravert, H.T., Dannals, R.F., Frost, J.J., 2005. Regional mu-opioid receptor binding in insular cortex is decreased in bulimia nervosa and correlates inversely with fasting behavior. Journal of Nuclear Medicine 46, 1349-1351. Acetylcholine is normally important for the satiation process. Hoebel, B.G., Rada, P., Mark, G.P., Pothos, E., 1999. Neural systems for reinforcement and inhibition of behavior: Relevance to eating, addiction, and depression. In: Kahneman, D., et al. (Eds. ), Wellbeing: the Foundations of Hedonic Psychology. Russell Sage Foundation, New York, 558-572. By purging, one eliminates the acetylcholine response that opposes dopamine. Thus when “bingeing” on sugar is accompanied by purging, the behavior is reinforced by dopamine without acetylcholine, which is more like taking a drug and less like normal eating. N.M. Avena, Rada, Hoebel (2008) Evidence for sugar addiction: Behavioral and neurochemical effects of intermittent, excessive sugar intake. Neuroscience and Biobehavioral Reviews, 29. The behavioral signs of drug withdrawal are usually accompanied by alterations in dopamine/ acetylcholine balance. During withdrawal, dopamine decreases while acetylcholine is increased. This imbalance has been shown during chemically induced withdrawal with several drugs of abuse, including morphine, nicotine and alcohol. Rada, P., Avena, N.M., Hoebel, B.G., 2005b. Daily bingeing on sugar repeatedly releases dopamine in the accumbens shell. Neuroscience 134, 737-744. Bulimic patients have low central dopamine activity as reflected in the analysis of dopamine metabolites in the spinal fluid, which also indicates a role for dopamine in their abnormal responses to food. Jimerson, D.C., Lesem, M.D., Kaye, W.H., Brewerton, T.D., (1992) Low serotonin and dopamine metabolite concentrations in cerebrospinal fluid from bulimic patients with frequent binge episodes. Archives of General Psychiatry 49, 132-138. We have shown that purging leaves dopamine unopposed by satiety-associated acetylcholine in the accumbens. This neurochemical state may be conducive to exaggerated binge eating. Moreover, the findings that intermittent sugar intake cross sensitizes with amphetamine and fosters alcohol intake may be related to the co-morbidity between bulimia and substance abuse. Holderness, C.C., Brooks-Gunn, J., Warren, M.P., 1994. Co-morbidity of eating disorders and substance abuse review of the literature. International Journal of Eating Disorder 16, 1-34. High Corn Fructose now represents more than 40% of caloric sweeteners added to foods and beverages. It is the sole caloric sweetener in soft drinks in the United States. The increased use of high-fructose corn syrup in the United States mirrors the rapid increase in obesity. Bray, Nielsen, Popkin (April 2004) Consumption of high-fructose corn syrup in beverages may play a role in the epidemic of obesity. American Journal of Clinical Nutrition, Vol. 791, No. 4, 537-543. Fructose is a unique sweetener that has different metabolic effects on the body than glucose or sucrose. Fructose is absorbed further down the intestine, and whereas circulating glucose releases insulin from the pancreas, fructose stimulates insulin syntheses but does not release it. Insulin modifies food intake by inhibiting eating and by increasing leptin release, which also can inhibit food intake. Meals of high-fructose corn syrup can reduce circulating insulin and leptin levels, contributing to increased body weight. Fructose intake might not result in the degree of satiety that would normally ensue with an equally caloric meal of glucose or sucrose. Based on our results showing that sweet taste is sufficient to elicit the repeated release of dopamine, we hypothesize that any sweet taste consumed in a binge-like manner is a candidate for producing signs of dependence. N.M. Avena, Rada, Hoebel (2008) Evidence for sugar addiction: Behavioral and neurochemical effects of intermittent, excessive sugar intake. Neuroscience and Biobehavioral Reviews, 28. Meals of high-fructose corn syrup can reduce circulating insulin and leptin levels, contributing to increased body weight. Elliot, S.S., Keim, N.L., Stern, J.S., Teff, K., Havel, P.J., 2002. Fructose, weight gain, and the insulin resistance syndrome. American Journal of Clinical Nutrition 76, 911-922. Bingeing on sugar can cause dopamine sensitization and opioid dependency, with withdrawal symptoms and long lasting aftereffects. Bingeing on sucrose does not cause obesity; the rats compensate for the added calories by eating less lab chow. But, if the sugar is high-fructose corn syrup, then the animals do gain excess weight. N.M. Avena, Rada, Hoebel (2008) Evidence for sugar addiction: Behavioral and neurochemical effects of intermittent, excessive sugar intake. Neuroscience and Biobehavioral Reviews, 31. Greater anticipated reward form food intake increases risk for overeating. Pelchat, M. L., Johnson. A., Chan, R., Valdez, J., & Ragland, J. D. (2004). Images of desire: food-craving activation during fMRI. NeuroImage, 23, 1486-1493: Roefs, A., Herman, C.P., MacLeod, C. M., Smulders, F. T., & Jansen, A. (2005). At first sight: How do restrained eaters evaluate high-fat palatable foods? Appetite, 44, 103-114. Anticipated reward from food is a stronger determinant of caloric intake than the reward experienced when the food is actually consumed. STICE, SPOOR, BOHON, VELDHUIZEN, AND SMALL. Relation of Reward From Food Intake and Anticipated Food Intake to Obesity: A Functional Magnetic Resonance Imaging Study. Journal of Abnormal Psychology 2008, Vol. 117, No. 4, 924-935. With functional MRI’s obese patients showed greater activation in the primary gustatory cortex and in the somatosensory cortex and anterior cingulate in response to our measure of anticipatory food reward compared with lean participants. STICE, SPOOR, BOHON, VELDHUIZEN, AND SMALL. Relation of Reward From Food Intake and Anticipated Food Intake to Obesity; A Functional Magnetic Resonance Imaging Study. Journal of Abnormal Psychology 2008, Vol. 117, No. 4, 924-935. A mantra of the food and beverage industry is that “there is no bad food.” Brownell, K.D., & Koplan, J.P. (2011). Front-of-package nutrition labeling – an abuse of trust by the food industry? New England Journal of Medicine, 364, 2373-2375. Thank you for attending my workshop. I hope you enjoy researching some of the information I presented. I am always interested in new research on this topic. I would very much appreciate you sharing your research, findings, comments, questions and opinions with me personally by commenting at www.RebeccaCooper.com/contact. I have many more forms, charts and questionnaires that can be downloaded free from www.DietsDontWork.org. You can also buy my books, workbooks, CDs, DVD’s, and obtain the PDF download of the Diets Don’t Work® book at www.DietsDontWork.org. Please visit www.SugarAwareness.com to record your experiences and beliefs about sugar consumption and/or see what others are saying about their experiences with sugar. If you want a free eating disorder assessment call 800-711-2062. To get information about eating disorders and treatment options go to www.RebeccasHouse.org. P.S. 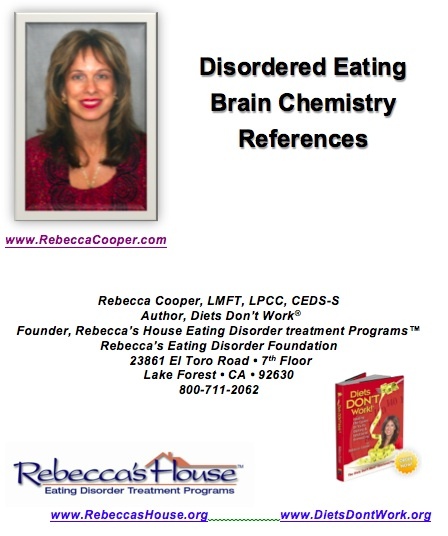 I would also like to give you my free e-Pub, “Living Diet-Free” by clicking the red box on www.RebeccaCooper.com/links. My trip to Savannah to be on TV is another adventure. I still love the south. People are so nice here and seem to be more centered than the hustle and bustle of California. It’s funny that I say that because I have carved out a sanctuary for myself right in my back yard that I become more centered in the mornings. It is true that it matters less of where you are physically than it does mentally, emotionally and spiritually. Maybe it is just easier when I am away from the daily routines and stresses of everyday life. Maybe it is because I realize how important it is for me to be centered when I am trying to bring awareness to the devastating illness of eating disorders. I can’t believe I actually will get in front of the cameras and the nervousness goes away as I focus of the importance of the message. Even if one person hears something that gives them pause to reevaluate their relationship with food and them Self it is worth it. Having such a mission is exciting. I never imagined that the worse thing I encountered in my life would also become my greatest gift. If I did not know first hand how crippling eating disorders were I would not be so passionate about helping others to avoid these pitfalls. The general public does not even know what an eating disorder is. They think it is someone starving them Self to be thin or someone who should just say ‘No’ to the food. They think they just need to quit eating so much, go on a diet, exercise more or stop the disordered eating behaviors. What’s more disturbing is that so many people whose lives are so compromised by disordered eating do not even know they have a problem. Some people have lived their life struggling with their weight, diets, body image and obsessive thinking about these things that they think it is normal. Eating disorder awareness is where alcohol and substance abuse was 20 years ago. When I first started working with patients with disordered eating fifteen years ago I worked with people who were having problems with yo-yo dieting. That is why I wrote the book, Diets Don’t Work. By that time I had years of recovery from an eating disorder myself. I listened to these patients with a different ear than most therapists. My patients were describing the self-hatred, loss of control, obsessive thinking, and suppressing feelings and stress with food. They described how this was affecting their relationships with their families and their Self. They described not being truly available to those around them because of always thinking about losing weight, finding the right diet or beating them Self up because they had once more slipped with their diet. The statistics are that 66% of Americans are overweight and 1/3 of these people are obese. Most of our health care cost is associated with the results of disordered eating. People are spending 60 billion dollars a year on diets, weight loss programs, diet foods, pills and products but as a nation we are more over weight than any time in history. Eating disorders are skyrocketing. We keep trying the same thing over and over again expecting different results. This is insanity. We keep looking for an external solution to an internal problem. I am going to Atlanta tomorrow to speak at a conference for mental health professionals about recognizing disordered eating, understanding the neurochemistry changes that exacerbate eating disorders and how to treat this disorder. Again I am so fortunate to have this opportunity. There are so many excellent professionals who have not been able to obtain treatment information or even be aware of this disorder in their patients. I hope I can ignite the desire to learn more about eating disorders so they can help so many more people than I can alone.